Home / News / Start your own revolution this Volunteers’ Week! Volunteers’ Week is brilliant for celebrating the many contributions our volunteers make to their communities up and down the country all year round. Yet for many, volunteering still has an image problem. This Volunteers’ Week we’re challenging young people across the UK to start their own revolution, and consider not just volunteering, but Full-Time Volunteering. Our Full-Time Volunteering programme is an opportunity for young people to discover what they care about, and do something about it. 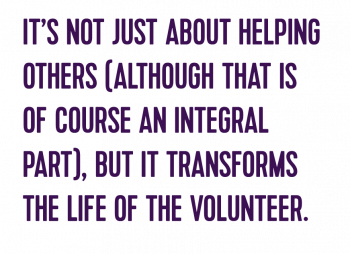 It’s not just about helping others (although that is of course an integral part), but it transforms the life of the volunteer. Yet not enough young people recognise volunteering in the UK as a full-time option, and the opportunities that could come from it. From Jess who discovered her passion for caring for people after providing respite for carers, which led to securing her dream job, to James who supports a BBC journalist with his everyday routine at work, becoming firm friends in the process. Our volunteers tell us they have increased their confidence, made friends for life, and discovered hidden talents they never knew they had. We truly believe in the transformative power of volunteering and what better time to shout about our incredible community of Full-Time Volunteers than during Volunteers’ Week? In doing so we want to build on the success of our new Revolution You campaign, designed to challenge preconceived notions of volunteering and encourage more young people to consider a gap year in the UK. We’re delighted by the reaction to the campaign already, and this week our first recruit through Revolution You starts his placement following recruitment and training! Want to find out more? Click below to watch the Revolution You film and share with anyone who might want to start their own revolution!